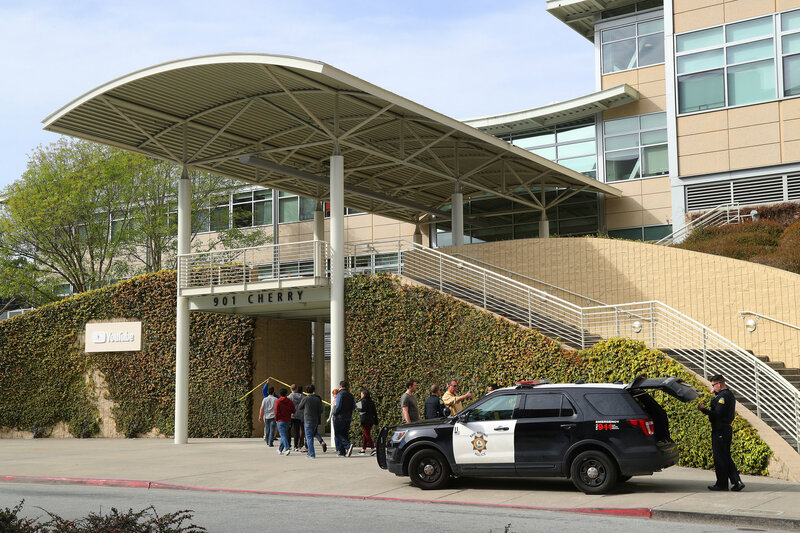 Small groups of employees were allowed to reenter YouTube’s headquarters in San Bruno, Calif., on Wednesday, a day after a woman shot three people in an office courtyard and killed herself. The attack has some companies scrutinizing their security policies. The laid-back companies of Silicon Valley are known for corporate headquarters that resemble universities, where employees mingle with tourists taking selfies and collaborations take shape out on the quad. At the Google campus in Mountain View, Calif., employees say the co-founders Larry Page and Sergey Brin stroll between meetings without an obvious security detail, and locals make off with the free bicycles for employees. But those generous green spaces and relaxed atmospheres come with a trade-off: They’re difficult to secure. Many Google employees love the headquarters’ open nature but some worry about it, according to one current and one former Google employee who declined to be named because of a company policy barring workers from speaking to the news media. There is often no barrier between employees and the public, they said. People — most likely other employees — sometimes slip into buildings behind workers with badges, they said, and neither had ever seen an armed guard on campus. Google declined to comment. The shooting this week at the headquarters of YouTube, a Google-owned company about 25 miles north in San Bruno, has highlighted the security risks of Silicon Valley’s relatively open corporate campuses — particularly as tech companies’ expanding influence angers more people online. But the risk is not confined to the tech sector. Many companies across the country are similarly exposed, reflecting an open-door policy that for generations has pervaded corporate America, where safety training has long focused on fire drills, earthquake-sheltering procedures and accident cleanup. Some of that trust has eroded over the years. After the World Trade Center attacks in 2001, companies fearing terrorist bombings and biochemical attacks taught employees how to handle suspicious packages. But a sharp increase in mass shootings over the past two decades has made companies increasingly nervous about gun violence from disgruntled workers and customers. Last year, an employee fatally shot three people at the United Parcel Service complex in San Francisco. In 2016, an employee fatally shot three colleagues and injured 14 more at a lawn care equipment factory in Kansas. In 2012, a man shot seven people and himself at a Minneapolis sign company hours after he was fired. On Tuesday, Nasim Najafi Aghdam, a YouTube user upset about the company’s policies, shot three people at the company’s headquarters before killing herself, police said.